A mysterious island, in the middle of nowhere. That’s the feeling this most western inhabited island of Japan gives you. High cliffs and rocky shorelines. That’s Yonaguni island. About 1700 people live here, most of them in the three villages Sonai, Kubura en Higawa. This island is different from the other Yaeyama islands. That’s probably because of the distant character and the history living throughout the people. 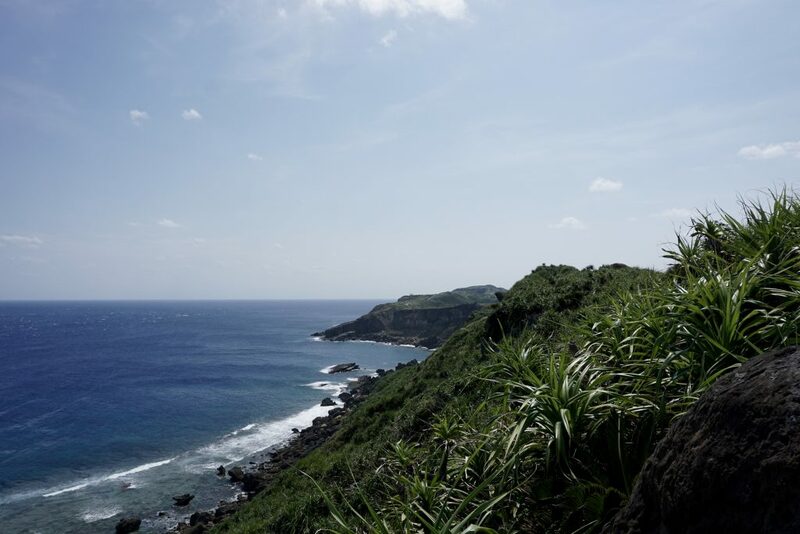 Choumeisou or ‘long life leaf’, is cultivated on all Yaeyama islands but since 2006 local farmers in Yonaguni work together with the oldest cosmetics company in the world, the Japanese Shiseido. 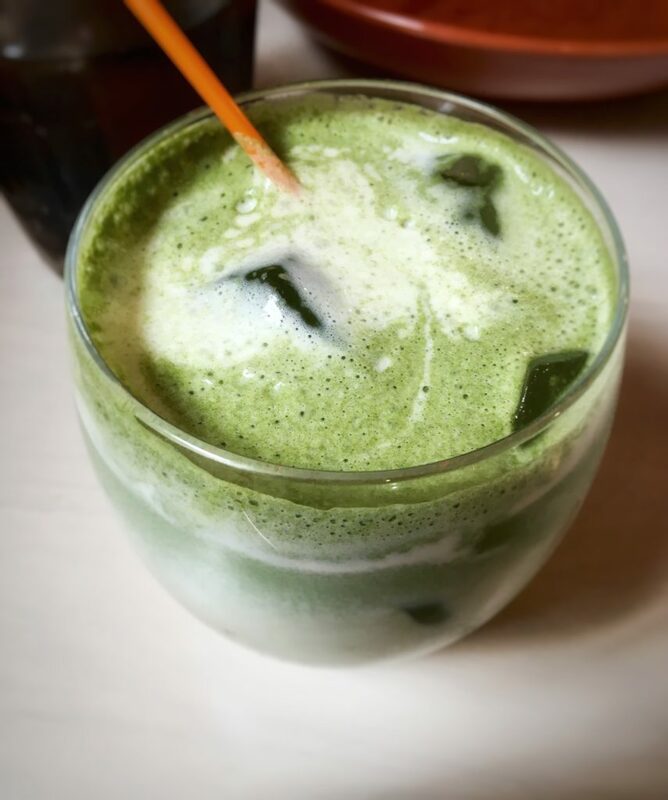 A healthy juice is brewed from this so called poer vegetable. It stores nutrients to protect itself against the rough ocean wind and UV radiation. A legend says, when you eat one chomei-so a day, you’ll live one day longer. We tried the juice in a smoothie, which was delicious. 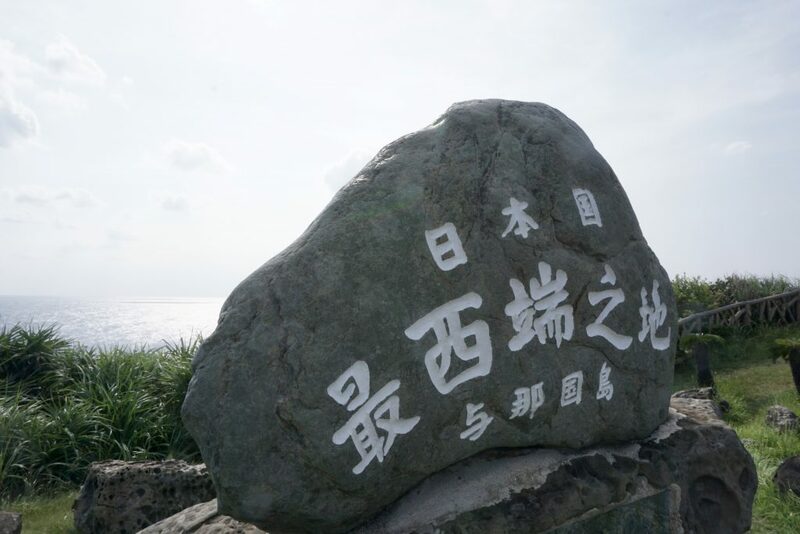 Yonaguni is a hilly island, mainly formed by rocks. Weather conditions vary a lot, which makes it a challenge to grow vegetables and fruits. Also supply is due to the remote location less frequent and more expensive compared to other islands. However around Yonaguni the rich ocean produces many kinds of fish. In the village Kubura, every morning at 8.30 o’ clock the fish market is taking place. A typical Yonaguni fish, caught by local fishermen, is swordfish. At every restaurant this fish is on the menu, often cooked in a variety of ways. 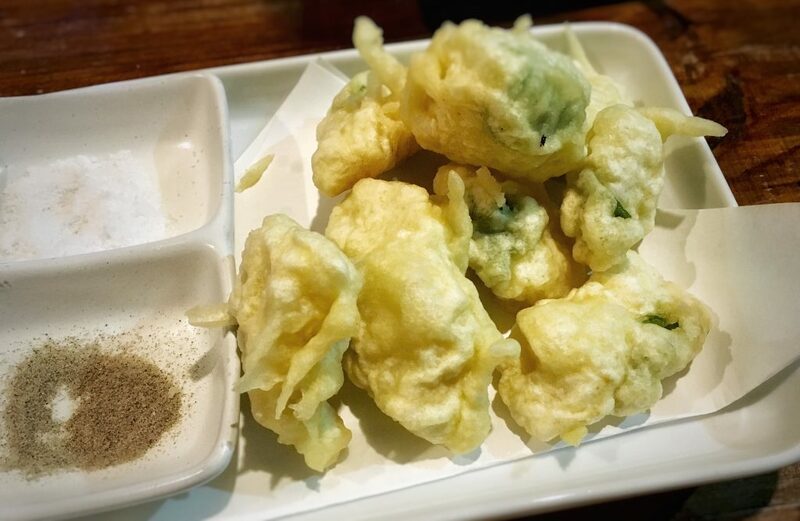 You can try the swordfish tempura with, of course, a chomei-so leaf! In the winter large groups of hammerhead sharks gather near Yonaguni. 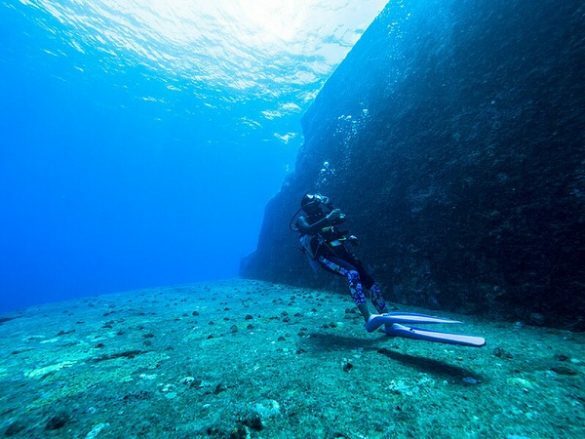 Although it’s never really busy, this is a popular time for divers to visit Yonaguni. Sometimes it’s possible to spot whale sharks, the only place in Japan. The biggest attraction is Yonaguni’s Atlantis, The Monument. 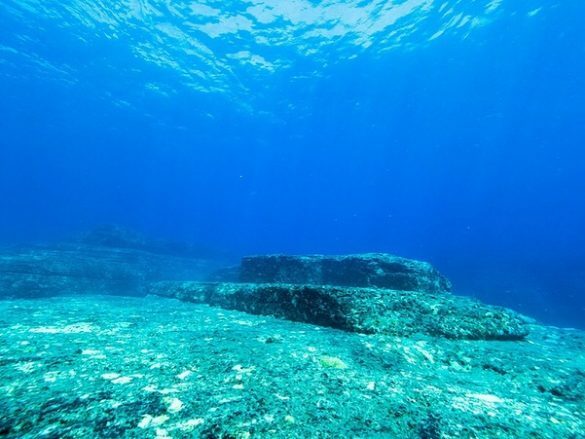 A terraced rock formation with flat walls and sharp edges, deep inside the ocean. If The Monument was made by hand or a natural phenomenon, is still a mysterie. Please keep in mind, that the ocean can be rough with strong currents. 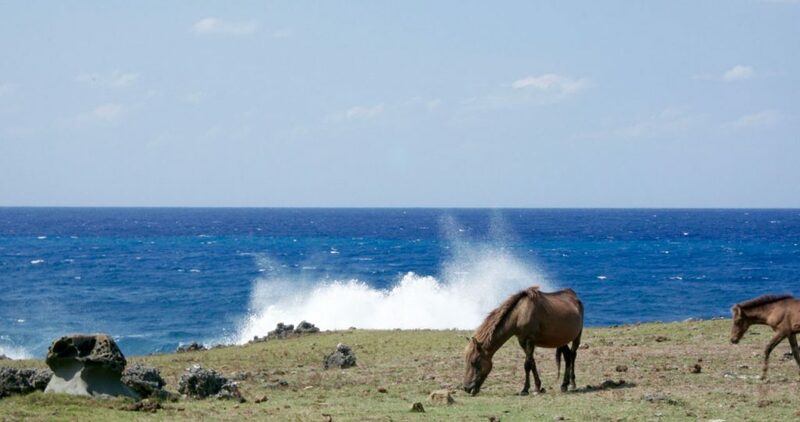 The small wild ponies, so typical for Yonaguni, are almost everywhere on the island. They are officially a national monument and have a friendly character. Cape Iri, the most western point of Japan. Yonaguni island doesn’t offer many places to stay. Only minshuku, the traditional Japanese guesthouses, and one hotel. Ailand hotel Yonaguni. If you’re planning to visit Yonaguni, it’s recommended to book a room in advance. Apart from a few local shops and post offices, there are no banks or ATM’s. Bring enough cash. If you want to take out money from a post office, take the office hours into account. Within a 30 minutes flight Yonaguni is accessible from Ishigaki (3x a day) or by ferry (2x a week) in 4 hours. Naha, Okinawa, has a daily connection by airplane. If you have the chance to take a propellor aircraft, the magnificent view comes with it.